Today was Ernest Hemingway's 116th birthday. 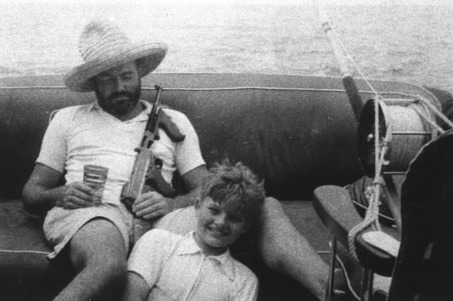 Young Jack Hemingway and his awesome, awesome dad. My dad took me fishing a lot when I was a kid, but our trips were never like this. There is so much manliness going on in this photo that you're growing chest hairs right now just from looking at it, even if you're a woman. I was searching for some old Keys pictures on Google when I came across this unbelievable gem. It was taken off Key West sometime in 1935 onboard Hemingway's yacht the Pilar. The fishing was obviously slow that morning so it looks like Papa settled into his second favorite pastime, drinking heavily. Even though I lived and worked as a fishing guide in Key West for over a decade, I never really got into Hemingway's writing. Seeing pictures like this might make me take another look at him. I also have a young son right now and I swear to someday recreate this photograph with him on a trip of our own.